If you got here from the link that Jamey Stegmaier posted in the Scythe Metal Mechs Special Edition Charity Auction on boardgamegeek, welcome! If you like podcasts about games or psychology, you have come to the right place! Let me know if you have questions! 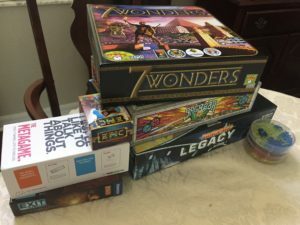 If you are unaware of this auction, Cognitive Gamer is part of a charity auction on the popular boardgame site, boardgamegeek.com. You have from now till mid-day Saturday to bid on the new metal mechs upgrade for Scythe. All proceeds will benefit charities that the various bloggers/podcasters/etc. that Jamey has picked to highlight during the auction. You can check it out here! Whatever Cognitive Gamer raises will go to the Boston Children’s Hospital Trust. Thanks so much! While I’m finishing up another podcast episode, I wrote up a blog post on boardgamegeek.com about my Cognition of Game Playing class that happened in the middle of May. It went extremely well! Please read about it here! I’ve now done four episodes of the podcast. I’m pretty proud of them. I know what the next two are going to be. The next one will be about decision making (well, one small area within decision making, as that broad topic could have 6-8 episodes at least). Then, the sixth one will be a different type of episode, one I’m currently calling a “game vivisection,” where I take one game and examine it from different angles, both cognitively and otherwise. I think I know which game it will be first. Six episodes then I think will be, not necessarily a “season” but a set. A set of episodes will then have 3-4 shows where I look specifically at a cognitive concept, relating that one concept to a number of games, 1 or 2 more philosophical podcasts, and then 1 or 2 game vivisections. And, there are people I don’t even know listening to the podcasts! The Word Press plugin I use gives me some info about number of downloads per episodes, along with how they got the episode (Hello! Overcast listeners; that’s the app I use; and, hi to my one listener from Stitcher!) I set a pretty modest goal of listeners for the outset, think double digits, and it has been met. Once I get six episodes in the can, I’m going to try to “market” a bit more and I have a new goal for after that. Thanks to all who have listened so far! Okay, the first episode of the podcast is now up on iTunes, Google Play, and Stitcher. More than likely, no matter how you listen to podcasts, it probably works with one of those services (but, let me know if it doesn’t). Please subscribe! The direct links to each of those services can be found here, on the About page. I have recorded the first podcast! I have the mp3 file that might be what I push out into the world as the first episode. I need to give it another good listen and get some feedback. 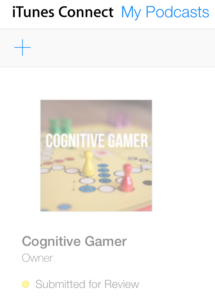 I have been figuring out ID3 tags and how exactly to register my podcast feed with iTunes’ podcast connect service so that everyone can access it. Perhaps by the end of the week anyone who wants can download the first episode! I have a draft of the second episode written, so it is almost ready to be recorded. I know what the third one is going to be about, and have ideas for the next couple. My hope is to have 6 episodes up on the RSS feed by the end of the summer (so, August 31, let’s say).